The IIT-JEE Physics question paper is no more a nightmare to students aspiring for a seat in one of the IIT’s, consequent on the changes effected from 2007. If you have good grasp of fundamentals, you should definitely take up the challenge for brightening your future. Students appearing for other entrance examinations such as Physics GRE, AP Physics, AIEEE, KEAM and the like also will find the IIT-JEE question paper very useful for their preparation. In a mixture of H – He+ gas (He+ is singly ionized He atom) H atoms and He+ ions are excited to their respective first excited states. Subsequently, H atoms transfer their total excitation energy to He+ ions (by collisions). Assume that the Bohr model of atom is exactly valid. E = – 13.6 Z2/n2 electron volt where Z is the atomic number. The energy difference between the electrons in first excited states of hydrogen atom and helium ion is (– 3.4 eV) – (– 13.6 eV) = 10.2 eV. of energy – 13.6 eV + 10.2 eV = –3.4 eV. Therefore the correct option is (C). The visible photons have wave lengths in the range 4000 Ǻ to 7000 Ǻ and their energies lie in the range 3.1 eV to 1.771 eV. [It will be useful to remember the range of energies in eV. You will definitely remember the wave length range of visible photons which you can convert into energy range using the equation, λ E = 12400 where λ is the wave length in Angstrom and E is the energy in electron volt]. The wave length of the light emitted in the visible region is therefore 124000/2.64 = 4800 Ǻ, nearly. The answer is thus 4.8×10–7 m [Option (C)]. The kinetic energy of the electron in the nth orbit is 13.6 Z2/n2. [Note that the kinetic energy and the total energy of the electron are equal in amount. But the kinetic energy is positive where as the total energy is negative]. The required ratio is ZH2/ZHe2 = ¼. All posts on Bohr model of hydrogen atom on this site can be accessed by clicking on the label ‘Bohr model’ below this post. You can find a few posts on hydrogen atom at apphysicsresources.blogspot.com also. One such post is here. 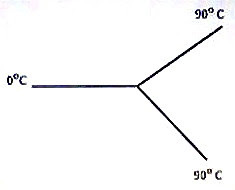 2×KA(90º – T)/L = KA(T– 0)/L where K, A and L are respectively the thermal conductivity, area of cross section and the length of each rod and T is the temperature of the junction in degree Celsius. BC and DA represent isochoric processes (in which volume does not change) and hence no work is done. So, the incorrect statement is (e). 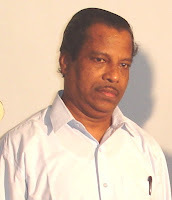 [Since Kerala entrance questions are single answer type there is no need of checking the other options when you are actually facing the examination. But it will be usful to know the correctness of the other options at the present moment. 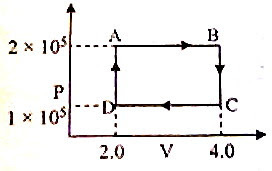 Work (PdV) which is equal to 2×105×2×10–6 = 0.4 J is done by the gas from A to B since the gas expands. Work (PdV) which is equal to 1×105×2×10–6 = 0.2 J is done on the gas from C to D since the gas gets compressed. Since the cyclic process is clockwise, a net amount of work is done by the gas and its value is equal to the area of the closed curve which is 1×105×2×10–6 = 0.2 J]. 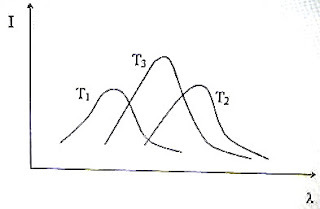 According to Wien’s law the product λmT is a constant (equal to 0.29 cmK) in the case of any black body (where λm and T are respectively the wave length of emitted radiation of maximum intensity and T is the temperature of the black body). Obviously, option (d) is correct. (4) A bubble of 8 moles of helium is submeged at a certain depth in water. The temperature of water increases by 30º C. How much heat is added approximately to helium during expansion? δQ = mCPδT wher m is the mass of helium, CP is its specific heat at constant pressure and δT is its rise in temperature. [You have to use CP (and not the specific heat at constant volume CV) since the bubble absorbs the heat at constant pressure. Further, since we are given the amount of the gas in moles, the molar specific heat is to be used in the above relation]. Thus δQ = 8×(5/2) ×8.3×30 = 5000 J, nearly. The angular miomentum of the system is conserved since there is no external torque. Therefore we have I1ω1 = I2ω2 where I1 and I2 are the initial and final moments of inertia and ω1 and ω2 are the initial and final angular velocities of the system. We have I1= MR2, ω1 = ω and I2 = MR2+4mR2. [Note that the four masses can be placed anywhere on the ring and you will get the same answer as above]. α = Change of angular velocity/Time = (300–100)/10 = 20 revolutions per second2. From the above equation, θ = 2000 revolutions. You can find all posts on rotational motion on this site by clicking on the label ‘rotation’ below this post. You have to use the equation, ω2 = ω02 + 2αθ for finding the angular acceleration α and hence the number of further rotations. Note that this equation is the rotational analogue of the equation v2 = v02 + 2as (or, v2 = u2 + 2as) in linear motion. This is a very simple question. The sum of the distances to be traveled by the two particles is 2πR = 2π×4 = 8π. The relative speed is 10 ms–1 so that the time required for the particles to collide is 8π/10 = 2.5 s.